MAX™ CAT Products are made with select ingredients and the vitamins and minerals your cat needs for health and wellness. 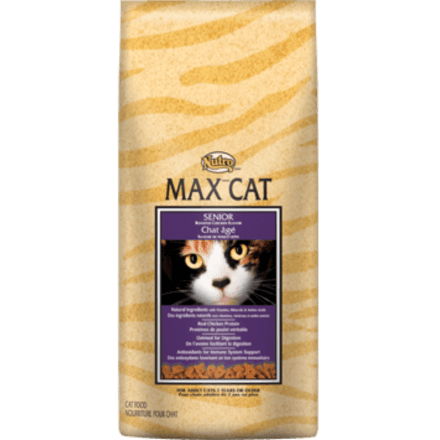 MAX™ CAT Senior Dry Cat Food Roasted Chicken Flavour cat food is specially formulated with senior cats in mind. Our natural senior cat foods are made with real chicken and other natural ingredients your cat loves for a price you adore. ‡Use a standard 8 oz. (250 ml) measuring cup, which holds 3.53 oz. (95 g) of NUTRO™ MAX™ CAT Senior Roasted Chicken Flavour Dry Cat Food.